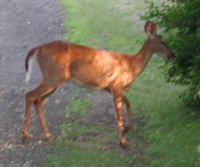 (White-Tailed Deer (Odocoileus virginianus) - 11) On 29 August 2002 we saw several white-tailed deer eating berries on the side of the road. They looked at us with a sense of curiosity rather than an instant sense of fear. This is a look that we have observed many times; several are presented in this photo journal. Every time we have had these encounters, it has dramatically reinforced our belief that hunters are among the most cowardly human beings upon this earth, for to take the life of such a trusting being could only be the act of cowardly individuals who have to cause others to suffer and die in order to "prove" their masculinity. (White-Tailed Deer (Odocoileus virginianus) - 12) We were only about 30 to 35 feet away from this mother and her child when we took this photo. Truly, the deer are living up to the standards of Isaiah's prophecy of the Peaceable Kingdom (11:6-9), even if some of our fellow human beings are unwilling to do so. There is a dark line running from Mom's eye to her lower jaw and we wondered if it was from a prior injury. 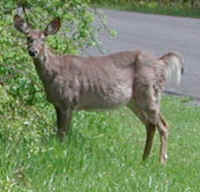 (White-Tailed Deer (Odocoileus virginianus) - 12a) This white-tailed deer appeared to be the leader of the group. 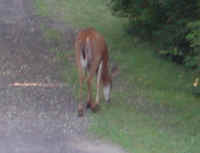 There appears to be the scar of a prior injury on this deer's left rear thigh. (White-Tailed Deer (Odocoileus virginianus) - 13) This white-tailed deer slowly entered the wooded pathway without even keeping a watchful eye on us. To us, this is further proof of the inherently peaceful and trusting nature of these beautiful creations of God. Thank you, Lord, for allowing this encounter. (White-Tailed Deer (Odocoileus virginianus) - 14) Looking into the eyes of this white-tailed deer was like looking into her soul. These magnificent animals deserve to live their God-given lives just as much as we humans do. How really depraved a human being has to be to take the head off such a wonderful living being and mount it on their wall! (White-Tailed Deer (Odocoileus virginianus) - 15) As we went on our way, we said good-bye to our friends and thanked them for allowing us to take these photos and to share them with our readers. (White-Tailed Deer (Odocoileus virginianus) - 01) The two white-tailed deer in this photo are almost completely hidden in the shadows of the woods. They are located about 1/3 of the way from the left and about 1/3 of the way down from the top of the photo. 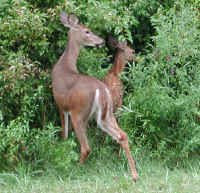 (White-Tailed Deer (Odocoileus virginianus) - 02) Mary spotted these two white-tailed deer as we were on one of our walks. 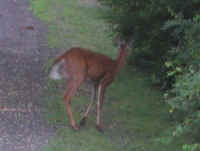 We and the deer spent about five minutes just watching each other (I was also taking these pictures). (White-Tailed Deer (Odocoileus virginianus) - 03) With their white bow tie neck markings, these white-tailed deer look as if they're dressed for a formal affair. Watching and photographing them was as though we were returning to the companionship of Eden, or moving towards the fulfillment of Isaiah's prophecy of the peaceable kingdom (Isaiah 11:6-9). Considering the length of time we spent looking at these deer only reinforces our impression of how cowardly and cruel hunters really are. (White-Tailed Deer (Odocoileus virginianus) - 07) We came across these two white-tailed deer as they were eating some of the new spring growth along the side of the road. The one continued to browse, while the other only exhibited cautious curiosity. There were no signs of fear. (White-Tailed Deer (Odocoileus virginianus) - 08) These white-tailed deer continued to browse, casting an occasional glance at us over their shoulders. (White-Tailed Deer (Odocoileus virginianus) - 09) Then these two white-tailed deer casually walked across the road in front of us, one stopping on the side of the shoulder for a nibble. There is absolutely no way that hunting these magnificent and peaceful living souls could be considered a "sport"; it is only a somewhat socially acceptable form of murder. (White-Tailed Deer (Odocoileus virginianus) - 10) These two white-tailed deer then slowly walked into the woods and disappeared from our view. 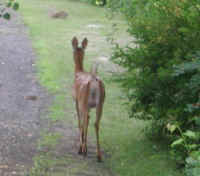 One of the deer even stopped to look back at us, as if saying good-bye. Once again we had experienced a taste of the peaceable kingdom (Isaiah 11:6-9), when we will no longer hurt or destroy because the earth will be full of the knowledge of the Lord. Our own personal experience and observation absolutely convinces us that it is only the human desire to hurt, kill and destroy that prevents Isaiah's prophecy from coming true. 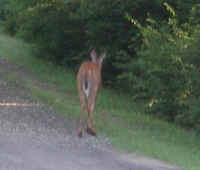 (White-Tailed Deer (Odocoileus virginianus) - 16) We were taking a walk during the second week of May, when Mary spotted this deer browsing along the side of the road. 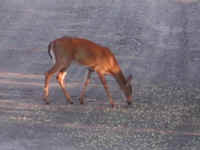 Deer should not be this thin, particularly at this time of the year, and we were concerned about her health, especially because she appears to be pregnant. 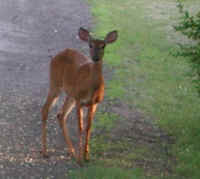 (White-Tailed Deer (Odocoileus virginianus) - 17) This is a closer look at this mother-to-be. Moments after we took this photo, there was a loud noise and she bounded off into the woods. We will keep her in our prayers. 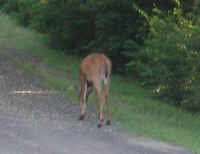 (White-Tailed Deer (Odocoileus virginianus) - 18) On 28 June 2003, while we were taking a late afternoon walk, we came upon this deer eating along the side of the road. (White-Tailed Deer (Odocoileus virginianus) - 19) As we watched this deer and continued to take these pictures, she moved about looking for more of the tasty tidbits that had fallen from the tree. (White-Tailed Deer (Odocoileus virginianus) - 20) The deer would occasionally look at us as we slowly walked toward her, but she continued eating. (White-Tailed Deer (Odocoileus virginianus) - 21) As we continued to walk closer to the deer, she took a longer look at us, and we were able to take this photo. (White-Tailed Deer (Odocoileus virginianus) - 22) The deer returned to browsing for food, obviously sensing no danger from us, even though we were upwind from her. 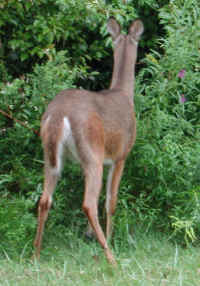 (White-Tailed Deer (Odocoileus virginianus) - 23) None of the photos of this deer were taken with a telephoto lens. She allowed us to get close enough to take them. 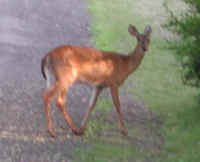 (White-Tailed Deer (Odocoileus virginianus) - 24) When she turned to walk across the road, the deer looked at us again. We believe that one of the reasons that we are able to get so close to some of the wild animals is that we are vegans (total vegetarians) and we don't smell like carnivores. 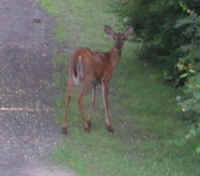 (White-Tailed Deer (Odocoileus virginianus) - 25) Our camera batteries had run out of power, so we had to change them. Upon returning to our observation of this deer, she had decided that the food she desired was not on the other side of the road, and turned back toward our side of the road. (White-Tailed Deer (Odocoileus virginianus) - 26) Part of the way across the road, the deer stopped to eat more of the tree-fallen tidbits. 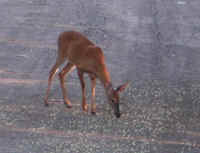 (White-Tailed Deer (Odocoileus virginianus) - 27) As she continued her walk back across the road, the deer continued to eat these tasty tidbits. 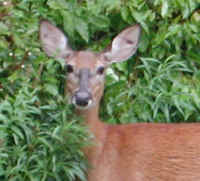 (White-Tailed Deer (Odocoileus virginianus) - 28) There is something very special about these gentle souls! We cannot understand how anyone could take pleasure in killing them. 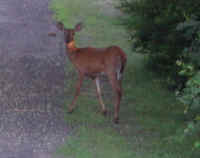 (White-Tailed Deer (Odocoileus virginianus) - 29) Each of our encounters with wild animals, such as the one we had with this deer, gives us a taste of the reality of the prophet Isaiah's peaceable kingdom foretold in the Bible (Isaiah 11:6-9). (White-Tailed Deer (Odocoileus virginianus) - 31) As she ate, this deer continued to walk across the road; and at the same time, we continued to move slowly toward her. (White-Tailed Deer (Odocoileus virginianus) - 32) When the deer finished eating, she looked up at us again. (White-Tailed Deer (Odocoileus virginianus) - 33) The deer took a couple of steps toward us, as we continued to look at each other. 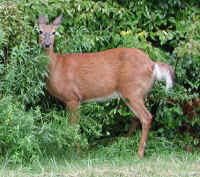 (White-Tailed Deer (Odocoileus virginianus) - 34) The deer then turned back to see if there was anything good to eat on the bushes. 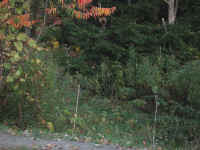 (White-Tailed Deer (Odocoileus virginianus) - 35) The deer then slowly turned away and began walking up the road toward the place where the rabbit continued to graze on the roadside salad. 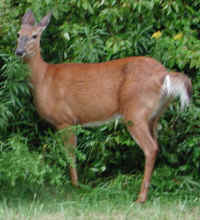 (White-Tailed Deer (Odocoileus virginianus) - 36) The deer then turned to reenter the woods. This encounter was truly a blessing.